Welcome back as we continue our road trip on the infertility super highway! If you missed yesterday’s post I would recommend reading Part I before reading Part II. Probably the worst part of any road trip is the traffic jams! 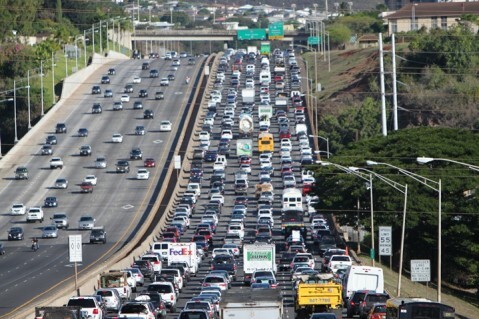 After living in Hawaii I have a whole different understanding of traffic jams! The freeway actually becomes a parking lot twice a day Monday through Friday and more often than not on the weekends as well. There are traffic jams on the infertility super highway as well. They come in the form of failed cycles of IUIs and IVF. They come when the money you have budgeted runs out. It comes to a screeching halt when devastated by the loss of a pregnancy or neonatal death. However the traffic jam manifests in your life try and approach them in a positive way. I know this is so much easier said than done. When you find this hard to do turn to James 1:2, “Consider it pure joy, my brother, when faced with troubles of many kinds”. Believe me I know this is a hard pill to swallow. But I can attest that there is joy to be found in our traffic jams! And sometimes the greatest joy is the joy you experience in your greatest trial. If you are currently stuck in a traffic jam crank up the music, roll down the windows, look around you at the beauty all around you. The beauty you would probably have missed had you been flying down the freeway traffic free. Like any road trip there comes a point when you have to take that exit and get off the freeway. You’ve found the exit and you go from 60-0 in a matter of seconds. Sometimes you get off where you want to but other times you are forced off for reasons outside of your control. Maybe you have been successful and your exit is called mommy-hood. Maybe your exit is called adoption and its leading you to a freeway change. Maybe your exit is called rest. Or maybe your exit is called child free. Whatever your exit is called recognize that the off ramp isn’t the end of the trip, it’s merely a transition from one route to another. You just have to keep driving! Every road trip is different. We all take different roads, drive different cars, and have different experiences. 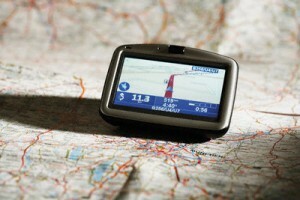 One thing that is necessary for all road trips though is a road map or GPS. We can’t get to where we are going if we don’t know how to get there. God’s word and the Holy Spirit must be the road map on our infertility road trip. He is our strength when we are weak. His voice whispers words of affirmation and encouragement just when we think we can’t go any further. And He directs our path when we turn to Him. Proverbs 3:6 says, “Seek His will in all you do and He will show you which path to take”. We may make the plans but the Lord will direct our paths (Proverbs 16:9). Its so easy for us to get in the car and drive and just wing it. But that only leads to dead ends and unnecessary detours. Seek God’s will and plan for your journey. Trust that He will select only the very best route for you. At church yesterday the pastor started his sermon by referencing the Rascal Flatts song “Life is a highway” and though his sermon continued about sin and the detours we try to take to work around it, it made me think about infertility. It seems like I can draw some kind of connect the dots game with infertility and almost anything else. Rest assured I put infertility on the back burner and paid attention to the pastor’s sermon and the words God wanted me to hear. After church however I couldn’t escape the truth behind the simple statement “life is a highway” or rather “life on the infertility super highway”. When we plan a road trip, or just get in the car to go somewhere we expect to start the car, pull out of the driveway, and drive to wherever it is we are going. We obey the traffic laws but we hope and expect to just get to where we are going. I think we expect becoming mommies (or daddies) ill happen much the same way. We get married, do the “deed”, and bingo-bango two pink lines and nine months later a beautiful, healthy baby swaddled tightly in your arms. Sadly for so many our road trip to mommy hood isn’t so easy. The beginning of the infertility journey reminds me of a roundabout. There is one way in but several ways out. Everyone else seems to know exactly where they are going and there I am sometimes I’m confident and sure and other times I’m stuck going around and around until I figure out which way to go. The worst roundabout I have ever experienced was several years ago in Paris. I swear it was like seven lanes wide and I don’t think anyone knew what the direction of travel was or if they even cared. It was a giant free-for-all. If you find yourself at this point in your infertility road trip take heart. It won’t last forever. Be patient, eventually you will discover your way out. As you continue on the infertility super highway you will inevitably happen upon a yield sign. Your yield sign may be waiting on God to determine what to do next. Your yield may be stepping back and allowing a mommy-to-be in your life to be filled. Your yield may be taking a break between treatments . Whatever your yield sign is be encouraged. This is the time I have found that God does some of his greatest work. Allow Him to pour into you. Be refreshed and renewed by the Holy Spirit. Believe me I know how hard this is. I’m a take chafe, proactive type of person and this “yield” time I’m in at the current moment has been the greatest challenge for me. But I can say with full confidence that while I have been yielding, God has been hard at work in my life. So you’ve been diagnosed, you’ve determined the course of treatment thats right for you, and you are moving forward. You have reached your on ramp. Everyone else is traveling at a high rate of speed and you are just trying to catch up. You have to merge, find an opening. Sometimes thats easy and sometimes thats hard, either way you are on and traveling along like everyone else. It doesn’t take long at all once you’ve merged on the freeway to remember that even though you are traveling at the same rate of speed your road trip isn’t like the other travelers. You hit a patch of bumpy road. You can still drive on this road and get to where you are going, but goodness it’s an inconvenience. Maybe you are switching doctors or treatment options. Maybe the treatment and the struggle to conceive is straining your relationships. The bumpy roads on the infertility super highway are inevitable but they don’t last forever. Recognize your pump roads and appreciate them. Consider them a sign from God that rough road is ahead if you don’t patch up the road you are on. Now if you are stubborn like me and you have ignored the “bumpy roads ahead” signs in your life you are bound to run right into a pot hole. Some pot holes are small, sneak up on you, cause a little bump, but little else. Others are giant pot holes that you can’t avoid. Losing Vance and Veronica was the biggest pot hole I have ever encountered. It WRECKED me. Put my “car” out of commission for quite sometime. This pot hole required serious roadwork and a long detour. God is the master road worker. His tool box and the equipment He has to use is beyond comprehension. He takes His time, never rushes, or cuts corners. When God begins His “roadwork” you can be sure He will complete the good work He has started. He will put up detour signs, and like me you might get frustrated that you couldn’t just take the easy way. But God’s way is always the best way! God’s roadwork results in new pavement. There is nothing like driving on a freshly paved road. Its smooth and quiet. Its like sailing more than driving. When you have found yourself on the “new pavement” on your infertility highway you will know that its the way God has chosen for you! *The road trip doesn’t end here. Stay tuned for Life On The Infertility Super Highway Part II. So we have moved to yet another new home (our sixth home in ten years actually) and with that comes meeting new people. Let me tell you for the mega introvert like myself, meeting new people is certainly not in my top five favorite things to do! I swear I get hives just thinking about meeting new people. I have to psych myself up for it. I run down every scenario possible trying to anticipate what questions may come up in the “get to know you chit chat”! I’m sure there has even been a time when I practiced in front of the mirror before leaving the house! Thankfully for me I’m married to Mr. Social Butterfly. When we go out together I usually let him do all the talking but unfortunately there are times when I must venture out in that big world all on my own! I have no idea why it is so important to ask a stranger if they have any children. At times I have felt as if my worth as a human in society somehow correlated with the number of children I did or did not have. Those with many children were some how of far greater worth in our society than I who for the moment is childless here on earth….. And then it struck me. I was looking at it with an earthy prospective. When I begin to look at it from God’s perspective a much more incredible picture of who I am begins to take shape. When I turn to God’s word and ask Him, “God who do you say I am?” He answers: “You are my child (John 1:12). You are a friend of Jesus (John 15:15). You are a co-heir with Christ (Romans 8:17). You are a citizen of Heaven (Philippians 3:20). You are LOVED by me and I chose you (1 Thessalonians 1:4). Most importantly you are of great worth, bought with a great price (Romans 5:8).” How incredible to see that I am all those things to my Heavenly Father. Meeting new people will more than likely still not be one of my favorite things. But now I have a whole new perspective. I’m fairly certain people will still ask me how many children I have… its inevitable. And I suppose I will have to discern the best answer for the situation. But from now on I refuse to allow my mommy hood (or lack there of) to determine my worth or who I am. Because clearly the only thing that is important is who God says I am! I love roller coasters. I must confess I’m finding I loved them more when I was younger, but I still love a ride on a good roller coaster now and then. The old wooden ones are the best. The sound of the cart clunking along on the way to the top. The wooden beams joined together that shows evidence of years of riders. The steady, slow climb to the top, that brief moment of anticipation and expectation before your cart plummets down the other side. In those first short moments your heart pounds and races a million beats a minute and then suddenly…. stops! Then the ride accelerates through highs and lows, corkscrews, and twists all before coming to a peaceful stop at the end. A roller coaster ride lasts mere minutes if you are lucky. All those sensations happening at once and then they are over leaving you breathless on an adrenaline high. There is one roller coaster however that I don’t like. I loathe it actually. That roller coaster has an awful name. Can you guess what it might be called? It’s called the emotional roller coaster. And I’m sure if you have journeyed down the road of infertility for very long you are well acquainted with this particular roller coaster. You start your family building journey expectant and excited. Slowly chugging along sure that anyday now a precious baby will begin growing inside. But after sometime you begin to realize its not going to be that easy for you (you have now reached the top of the ride please keep your arms and feet inside the ride at all times and please fasten your seat belt…. this WILL be the roughest ride you have ever been on). From here you plummet at breakneck speeds to the ground. Joy and excited expectations have turned into grief and despair, which will mellow out as you prepare for what comes next in your journey. And again joy and contentment spin haphazardly into anger, bitterness, jealousy, and resentment. The ride rushes on in spontaneous patterns for however long you remain in your seat. Each phase of the ride varies in length and sometimes you think you’ve been on the ride for too long so it slowly rolls to a stop, but only briefly because you may be like me and just too darn stubborn to get off this evil ride. So around and around you go on the crazy emotional roller coaster. You laugh and enjoy it, you cry and scream for dear life to get off. Your emotions are all over the place you often wonder why no one has locked you up in a padded room somewhere! I often wonder if my jumbled emotions reflect a wavering faith. I feel at times that if I’m not riding this crazy ride with an appearance of joy and constant contentment that some how a chink in my faith armor has been revealed. As a believer I KNOW that God will always provide for all of my needs. I KNOW that His grace is always sufficient in all circumstances. I also KNOW that He has a great plan and purpose for my life. I KNOW this so why do I hurt? Why am I so angry, bitter, and jealous at times? Why do I feel such sorrow at our loss that at times that it takes my breath away? Why do I feel as if sometimes God has forgotten all about me? I suppose the short answer is I’m human living in a fallen world. However Jesus tells us in John 16:33 “In this world you will have trouble…” It should come as no mystery to me then. When reeling like this I look to Jesus. The whole “what would Jesus do” saying comes to mind. Jesus was sent to earth fully God and fully man. He experienced life, it’s joys, pain, anger, and sorrow during His time here on earth. But while Jesus experienced all these things He never wavered, never lost sight of who He was and to whom He belonged. For Jesus it wasn’t the fact that He felt these emotions it was how He expressed them that brings me encouragement and guidance. Jesus rejoiced with those around Him. He wept openly and privately. He cried out to His Father in Heaven even asking “Father why have you forsaken me?” But the one thing Jesus never did was sinned. He never let His emotions control Him or His actions. And although Jesus is the Son of God and the complete image of perfection I can still use this as a guide to how I express my crazy emotions on this crazy ride. I will never waver in my faith. I will never allow anger, bitterness, or jealousy harden my heart or cause me to turn away from me Father in heaven. I will pray and seek God’s guidance prayerfully as I seek His will and His plan for our future child. I will try and take off my running shoes and exchange them for laid back “slippas” and remind myself that I can not rush ahead and try to beat God to the punch. I will remind myself daily, “Be angry and do not sin; do not let the sun go down on your anger, and give no opportunity to the devil” (Ephesians 4:26-27! My birthday was yesterday, and just like every other birthday or holiday my husband spent the last week asking what I wanted. Immediately off the top of my head I thought, “I want to be moved into our new house already” (we have been moving cross country for about a month and a half now). Of course there is no way for him to speed up time or move our position on the housing list so that was out of the question. And since we are living in a small hotel room there isn’t much necessity for any household item, so I was stumped. What was one thing that I wanted for my birthday? “I want a baby” whispered my heart! Although my mind was contemplating tangible items I might fancy, my heart knew the one true thing that I desire more than anything! We live in an age of instant gratification. We want something we rush out to the store and buy it. I have one touch shopping on my iPhone and iPad. With one click I can have that item purchased and preparing for shipment within seconds. If money isn’t an object for you, you can have just about anything you desire. However the last time I checked there wasn’t a little baby emporium that keeps adorable cherub-like babies on the shelf. I’m sure if there was one I would have stocked up on babies a long, long time ago! So needless to say there wasn’t a baby for my birthday waiting for me. The longing, the ache, and the desire is still there. At times its unbearable. At times the thoughts and feelings of guilt and shame creep in and overwhelm my whole being. I know however that those thoughts do not come from above. They come from an enemy whose soul mission is to cause me to stumble and turn my focus away from my Heavenly Father. So I fight harder. I cling to God’s word and His promises for me. And I pray…A LOT! Just the other night actually, I was wide awake hours before my alarm went off for church, and while contemplating for the hundredth time “always a godmother, never a mommy” I began to silently cry out to God. “Father God I pray for a miracle. I pray for a son to carry on my husband’s name. Father please don’t forget me or my desire.” I call these my Hannah moments! Anyways I eventually fell back to sleep and thought the moment was over. That was until I was sitting in church and the chaplain boldly announces the message title was “Where Is My Miracle?” It was one of those moments that make you sit up straighter in your seat and look around to see if anyone else can spot the target the preacher just placed on your forehead! Am I willing to be obedient (even when it seems crazy)? Am I willing to give God all the credit? Am I willing to endure hardship? Now I know thats not to say you merely answer yes to all these questions and sit back waiting for miracles to rain down from heaven. What I think the chaplain was saying was when we are obedient, when we are willing to completely remove ourselves from the equation, we allow God to work out things in far greater ways than we can imagine. We just need to allow God to come out of the box we have tucked Him into recognize that His ways and His miracles will never look like how we expect them to. Most importantly I will remember and cherish the fact that I have already received the most precious gift of all. I have received the gift of eternal life. I have inherited the kingdom of heaven and all that my Father chooses for me. My precious savior and redeemer carried my shame and sins and endured the cross (the ultimate of hardships) so that I may freely receive His precious gift to me. Everything else is just an extra blessing He has chosen to pour out to me! Lately God is pressing upon me that we all have a story. Every story is unique and special but they all serve a purpose. The purpose is twofold. First and foremost our story is meant to glorify our Creator. That is why we were created in the first place. Second our story is meant to grow us spiritually. Life’s journey, it’s ups and downs, are intended for us to learn who we are in Christ. Do we reflect the image of our Savior? Are we a light upon a hill shining a light into the darkness? By sharing with you my testimony it is my prayer that I am shining a little bit of light into this dark world. With my testimony I wish to glorify God with all my heart. I wish to give Him all the credit for what He has done in my life in the midst of the darkest times I have ever experienced. I want to do like David urges in Psalm 26:17, “Proclaim with the voice of thanksgiving and tell of all your wonders”. God is constantly doing a great work within me and what good is it if I hide it in the secret place of my heart? This journey through infertility has not been easy. I have traveled through the darkest pits to the highest mountain over and over again. I have felt like Sarah where in Romans 4:19 Paul said, “Sarah’s womb was dead”. I have experienced that feeling of empty hollowness. I have found myself laid out on the floor weeping and praying as Hannah did in 1 Samuel, “O Lord Almighty, if you will look upon your servant’s misery and remember me, and not forget me, but give me a son (in my case any child was sufficient I wasn’t going to be picky)”. It goes on to say in 1 Samuel 1:13 Hannah was praying in her heart, her lips were moving but her voice was not heard. I could totally relate. It felt like the prayer for a child was emblazoned on my heart for so long. After 6 plus years of trying to have a baby (naturally, IUIs, and finally IVF) I was blessed with a pregnancy. It seemed God had lined up every detail just in the exact order He wanted. Only He could have worked that all out. Learning about and experiencing IVF has only solidified in my mind the awesomeness of God and the miracle of life. All the little details that have to come together just right at just the perfect moment for life to be created. The fact that any of this happens naturally blows me away! God certainly makes it look so easy. I believe God allowed for me to become pregnant to prepare us for what happened next. At 22 weeks I gave birth. Not just to angels but to a testimony. Of course at the time I didn’t see it that way. At the time I was pleading with God to save them, to protect my small children, to save them from harm. And despite the outcome, or maybe inspire of the outcome, I believe God answered my prayers. God saved them, I will never have to wonder if my children will stray from the Lord. And He did protect them. They are perfect and blameless in the presence of our Savior, secured in Heaven for an eternity. My children felt my love, they heard my voice, and then they went to be with Jesus, safe and protected forever! God always answers our prayers, sometimes they just don’t look the way we had planned. Proverbs 19:21 tells us, “many are the plans in a man’s heart, but it is the Lord’s purpose that prevails”. Loosing my children has taught me so many things. It’s taken me to the darkest pit I have ever known. It’s taken me to a place where I longed to die for that would allow me to finally be with my children. As I was battling with myself during this time God revealed to me two scriptures. Ecclesiastes 7:14 “When times are good, be happy; but when times are bad consider: God has made them one as well as the other”. Also Lamentations 3:31-33, “For men are not cast off from God forever. Though He brings grief, He will show compassion, so great is His unfailing love. For He does not willingly bring grief or affection to the children of men”. These scriptures forced me to realize although God allowed such grief, He had a reason for it. He wanted me to learn something. There was nothing I could do to change what happened, all that I could do was change my response to it. I could turn to God. By turning back to God, to believing in my whole heart that He intended only good for me I began to see my faith grow. He made my faith stronger in my weakness. His presence became tangible and I began to hear His voice in a way I never had before. And all of this has given me a small glimpse into God’s sacrificial love for us. The pain of loosing my children was paralyzing. My heart was ripped to pieces when the nurse told me, “All that’s left to do for them is to love them until they pass away”. They are words that will be etched on my heart forever. I thought of Mary the mother of Jesus. Standing at the foot of the cross watching her perfect and blameless son tortured and killed and there wasn’t a thing she could do about it. All she could do was love Him. And to think “for God so loved the world He gave His only Son that whoever believes in Him shall not perish but have eternal life” (John 3:16). God willingly sacrificed His Son for a sinner like me. I can’t fathom that. There is not a single person on this earth I would sacrifice my children for. But God did that for me centuries before I was even created! Through infertility and the loss of my children I have learned another valuable lesson. I have learned that, like Paul, I had a thorn in my flesh. For me my thorn was the longing and desire to be a mother. I placed that before all else. More often than not I placed that before my heartfelt worship for God. Having a baby was my idol I worshiped! Like Paul a time came where I recognized this a cried out to God to remove it from me. If it wasn’t His plan for me to have a baby then Father God take away the desire. But one day in a very clear voice while pumping gas God said, “My grace is sufficient, my power is made perfect in your weakness” (2 Cor. 12;9). I couldn’t for the life of me figure out what He could possibly be saying. Right, I know your power is perfect but what on earth do you mean when you say my grace is sufficient? Over the next 8 months after loosing my son and daughter, and after truly plugging back in to prayer and bible study I began to notice something happening. My heartfelt prayer longing for a baby became a heartfelt prayer to know Him more. Lord give me a baby became Lord give me all of you! It was then that I realized His grace IS sufficient. Though I still pray for a baby. I still long to be a mother here on here, I know God has already prepared a way for me to be a mother for eternity. One day I will push my son and daughter on a swing set high and lifted up! One day I will hold my children in my arms as we worship and give honor to our King. But until that time I will worship and give honor to my King from here on earth. Until that day I pray that Jesus draws my son and daughter onto His lap and tells them about me and how much I love them with all my heart! Until that day I will proclaim to all the world the wonderful works my Heavenly Father is doing in my life. “How great are your works, LORD, how profound your thoughts” Psalm 92:5. “I will sing of the LORD’s great love forever; with my mouth I will make your faithfulness known through all generations” Psalm 89:1. So I know I have been away for a short time but it’s been for a good reason. I was blessed to attend a C.A.L.D. (Christ Appointed Leadership Development) workshop hosted by the PWOC (Protestant Women of the Chapel) group that I am a part of. I encourage you that if you live near a military installation , check and see if their chapel has a PWOC. Whether you are a military spouse or not I know you will be blessed. Anyways I would love to share with you what God shared with me during this workshop. First and foremost God has created us individually and has penned a very unique signature on your life. 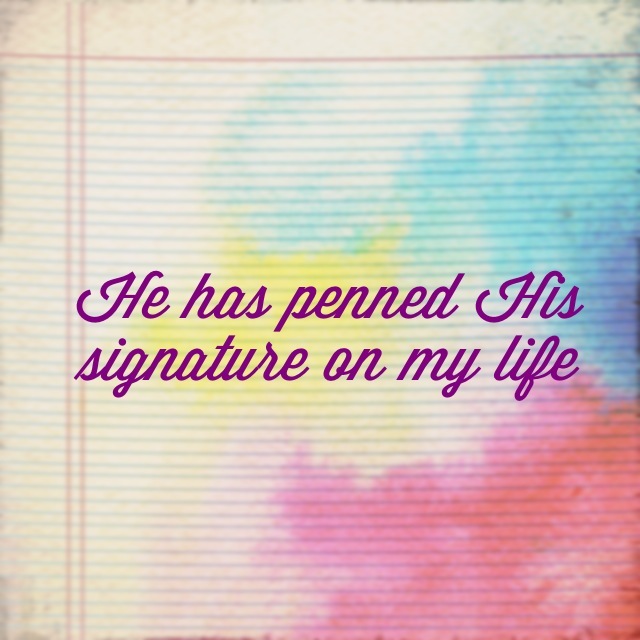 How He has signed my life will not look like how He has signed your life, and my story won’t look like your story. But He has a very good reason for this (obviously). Before I go further let me explain what I mean by signed (full disclosure this is something I learned at the workshop so I can not take credit for this nifty acronym): Strengths, Interests, Gifts, Nature, Experiences, Devotion… S.I.G.N.E.D. We each have different strengths, interests, gifts, nature, experiences, and devotion, and combined together they make up God’s signature on our life. What spoke to me the most was the experiences part. We all have vastly different experiences that God has allowed us to go through for a reason. He has allowed me to experience infertility, years of trying to conceive, the joy of pregnancy and child-birth, and sadly the tragic loss of my son and daughter. Although I may not fully understand the why of all this, I am confident of three things. First God has a very good reason for it. Second, this is exactly what He had planned for me before I was formed in my mother’s womb. And third, He is working it all out for my good! Praise God!! In Jeremiah God speaks to Jeremiah and tells him, “Before I formed you in the womb I knew you, before you were born I set you apart; I appointed you as a prophet to the nations” (Jeremiah 1:5). Now we may or may not be appointed prophets but you better believe we have been set apart. God has written your infertility and/or loss story on your heart and He desires that you use it and share it to glorify Him. As we contemplate the story He has written and how uniquely He has signed His signature we need to recognize three things: How has He made us, how He speaks to us (believe me He is ALWAYS speaking the question is are we ALWAYS listening), and how do we fit into His design. Now you may be like me and hear all this and think, “Goodness why use me, I’m flawed, broken, insufficient, sometimes I feel worthless”. But when God looks at us all He sees is a perfect vessel that He can use. Remember 2 Corinthians 12:9 God says, “For my power is made PERFECT in weakness!” All He requires is faith and obedience, He can take care of the rest. And something else we are God’s masterpieces, lovingly and carefully created (inside, outside, and all that we experience) as a one of a kind work of art to be used however He chooses. That means all strengths, weaknesses, triumphs, and trials. Ephesians 2:10 says, “For we are God’s workmanship, created in Christ Jesus to do good works, which God has prepared in advance for us to do! And we know that God causes EVERYTHING to work together for the good of those who love Him and are called according to His purpose (Romans 8:28). Are you still not convinced that He created and signed us and our experiences for a purpose? Do you still not feel adequate enough (I know I need a little more convincing sometimes)? Let me share this with you that I found recently floating around Facebook. Next time you think God can’t use you remember: Noah was a drunk. Abraham was old. Isaac was a daydreamer. Jacob was a liar. Leah was ugly. Joseph was abused. Moses had a stuttering problem. Gideon was afraid. Samson had long hair and was a womanizer. Rehab was a prostitute. Jeremiah and Timothy were too young. David had an affair and was a murder. Elijah was suicidal. Isaiah preached naked. Jonah ran from God. Naomi was a widow. Job went bankrupt. Peter denied Christ. The disciples fell asleep while praying. Martha worried about everything. The Samaritan woman was divorced more than once. Zaccheus was too small. Paul was too religious. Timothy had an ulcer. And Lazarus was dead! I might add myself to that list… I don’t have a sense of smell, I have half a uterus, I’m infertile, I’ve lost my children, I’m terrified of public speaking, and I tend to be socially awkward and yet I am learning when I answer God obediently, He can do remarkable things inspire of my weaknesses and failures. Praise you Father in Heaven that you are far bigger, stronger, and greater than me! I will be the first to admit I’m not perfect. Even in the midst of claiming victory and rejoicing in all the things God has done through our infertility and loss, I still have tough days. Days when I’m angry and sad. Days when it just doesn’t make sense to me. Days when I just have a pity party for one. Today is that day. A day when God’s grace HAS to be sufficient. A day where I have to remind myself I am perfectly how God created me to be. A day where I have to remember His plans and timing are perfect. A day where I must refocus my gaze Heavenward instead of a cold, empty womb. We are in the heart of spring time and it seems like everyone and everything is pregnant. There are pregnant women everywhere, new birdies chirping away in nests, and I’m sure there is a little borough somewhere overflowing with adorable baby bunnies. But not in this house. Here we are playing the waiting game. It’s like the starring game – the one who blinks first looses – although with the waiting game sometimes it never seems like there is a winner. Which I know is a lie because the bible is full of scriptures praising those who persevere through trials. I know one day when God’s perfect plan is revealed I will receive my prize! I know, I know, who am I to question God’s plan. I don’t know how He intends to use their pregnancies for their good. Ad I have faith that He will keep His promises to me. SO I silently say a prayer and ask for forgiveness and count my blessings that I have a God who pours out more grace than I could ever deserve. I hear a soft voice in my head whispering, “For our light and momentary troubles are achieving for us an eternal glory that far outweighs them all” (2 Cor. 4:17). 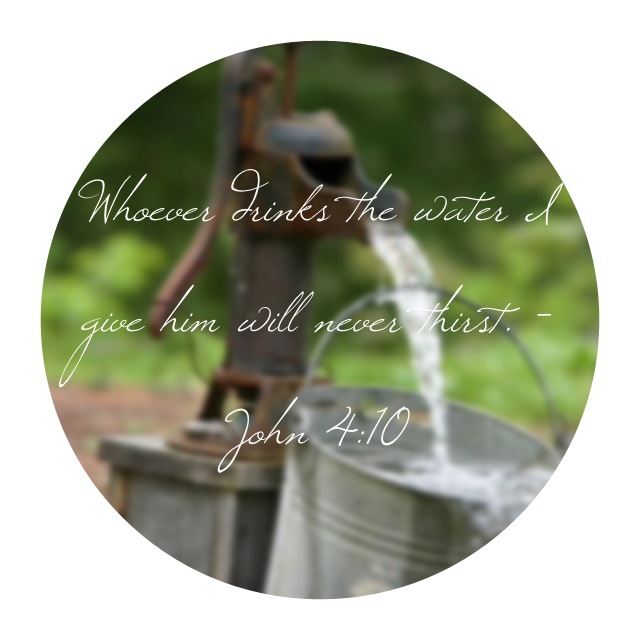 I remember the story of Jesus at the well with the Samaritan woman. He says to her, “If you knew the gift of God and knew who it is that asks you for a drink, you would have asked Him and He would have given you living water” (John 4:10). Well I know who I am asking. I know who He is and what He offers. And it’s days like today where I want to plant myself at His feet, throw back my head, open my mouth up wide and guzzle that living water right up! I need for Him to quench my thirst and remind me that He is al I need. And how comforting is it to know that in my moments of weakness His power is made great. In my moments of weakness I can feel Him wrapping His arm around me and lifting me back up. God knows it’s impossible for me to be strong every minute of every day. I’m so blessed that He’s equipped me with the tools I need to survive those moments. Though the fig tree should not blossom and there be no fruit on the vines, though the yield of the olives should fail and the fields produce no food, though the flock should be cut off from the fold, and there be no cattle in the stalls, yet I will rejoice in the Lord, I will be joyful in God my savior. The sovereign Lord is my strength; He makes my feet like feet of the deer, he enables me to go on the heights (Habakkuk 3:17-19). Though my womb may not be fruitful, I can rejoice because my faith is certainly bearing much fruit. And I must remember that is the most important thing of all. As you may or may not know, my husband is in the Army. One of the many “blessings” that comes with that is the joy of having Army equipment strewn about every room in the house. After more than twelve years of Army service my husband has A LOT and i have grown accustomed to equipment becoming prominent fixtures to every room. That being said, I was struck by something beautiful this morning when I came downstairs on the way to the kitchen for my Best Morning Friend Cup-O-Joe. I walked by the usual pile of equipment in the living room but this morning I stopped. I stopped and stared captivated by a sudden thought. Just as my husband puts on his full armor in preparation for battle, so too have I as I have been waging this battle with infertility. The fight with infertility is certainly a very physical one. We subject ourselves to a barrage of exams and testing, we volunteer for procedures that others would cringe away from. We repeatedly go back for “just one more” fertility treatment clinging to the hope that the third, fourth, fifth, sixth, heavens seventh time is the charm! We are also waging a spiritual battle with the prince of darkness. The enemy that comes to kill, steal, and destroy. An enemy that is cunning enough for us to begin to believe his awful lies despite knowing full well God’s truth. Sometimes we suffer wounds from insults (even well meaning comments pierce the heart like a mighty sword). We fall victim to the temptation to advance forward even when God is telling us to “be still and know that I AM GOD”. We become casualties of our own making, believing the enemies lies about our worth and value, instead of claiming victory that we are exactly as God created us to be. Let’s commit ourselves to donning the helmet of salvation. No attack from the enemy can take away the precious, free gift from our Father. 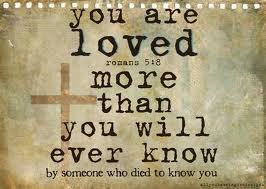 He loved us so much that He sent His only son to die for us. 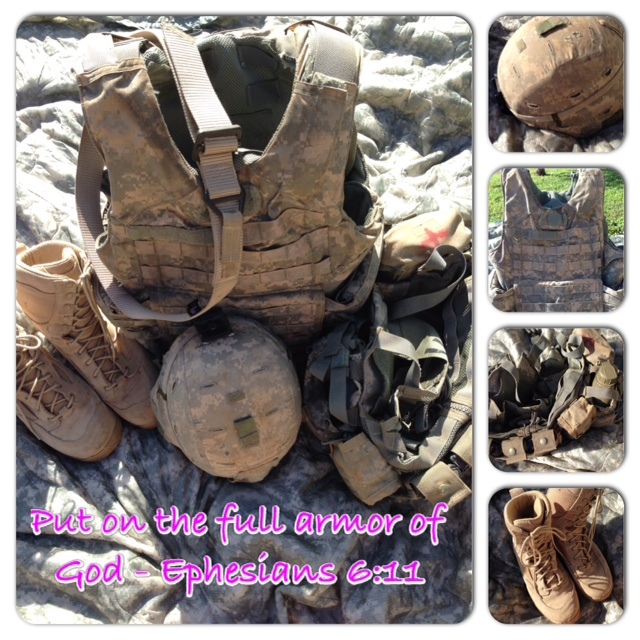 Let us guard our hearts with the breastplate of righteousness. God’s righteousness is what protects our hearts from the enemy and ensures His approval of us. Pick up your shield of faith and carry it boldly! It will protect you from every blow the enemy will throw at us. Keep a Godly prospective and look beyond your current circumstances. Take up your sword of the Spirit. It is the only offensive weapon we have or will ever need. There will be times when you will need to get down into the trenches, low crawl to the front lines, and lead the charge headfirst into the enemy. Trust in the truth of God’s word and be confident that the ultimate victory is ours. Tighten your belt of truth. Make it so snug that not even the tiniest of lies from the enemy has room to creep in. In God’s eyes we are more than enough. We are priceless to Him and He has great plans for us.! And finally lace up the footgear of readiness to spread the good news and proclaim it. We can do all things through Christ who strengthens us (Philippians 4:13). Boldly spread the good news so that others may claim victory as well. One final thought. Just as in the battles of old, where the little drummer boys would motivate the soldiers with their drums, let God’s faithfulness motivate you through your battle. Let it be the tempo to which you wage you fight! He is and always will be faithful to every one of His promises from beginning to end! Now claim your victory! The hubby and I just got home from a relaxing, long weekend on the Big Island where we were celebrating our tenth wedding anniversary. 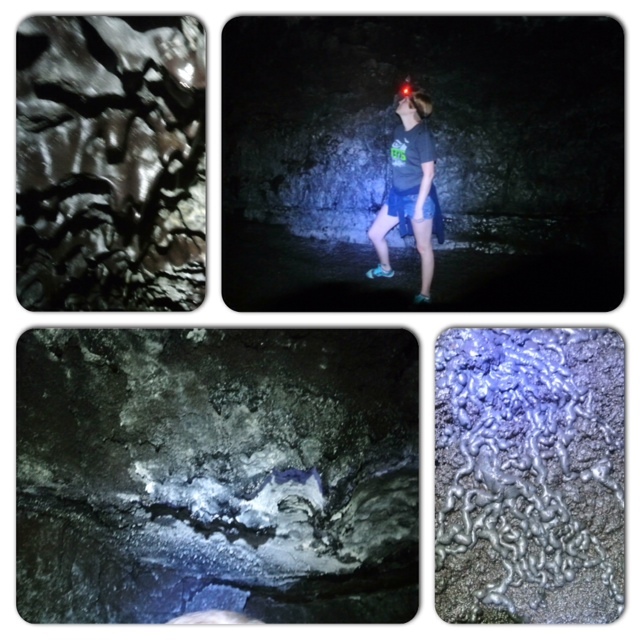 While we were there we did a little cave exploring. We had done it before and had a blast so we knew we had to do it again. It amazed me how even though we had gone almost a year ago, the moment we stepped passed the threshold and crossed into the part of the cave where light no longer reached, it was still pretty scary. So anyways, we are hiking along until we reach the part in the cave that gets really hairy. Large lava rocks cascading everywhere, the passageway begins to get really narrow, and you could almost swear you can hear the abyss monster crunching on something up ahead. So of course we figure it was time to turn around and head back. As we were walking along in silence enjoying the quietness of the cave it occurred to me that this was kind of like how life was like after Vance and Veronica passed away. The days, weeks, and even months after we lost them I felt like I had reached the very impassable end of a treacherous dark cave. Life was unbearable. I couldn’t fathom that the unthinkable had just happened to us. I remember laying in the hospital bed that first night sobbing, asking God why He didn’t take me instead. Dying would have been so much better than lying there trying to figure out how I could go on living without them. It went on like this for days. Luckily for us my mom came and stayed with us for a few weeks and that offered some relief. But when she left it was back to the dark void that had become my life. I would find myself alone thinking that it would have been so much easier if I had died (the thought was overwhelming at times). Praying that God would choose to take me while I slept. I was living in darkness while life around me returned to normal. Of course, He didn’t take me, that just wasn’t part of His perfect plan. As days turned into weeks, weeks into months, SLOWLY things got better. The pain eased slightly. I heard God calling me back to Him. Eventually I just couldn’t carry the burden any longer. I had to throw myself down and crawl to my Savior’s feet. It was at that very moment I began to live in the light again. I began to see the light at the end of my dark tunnel. The ground beneath my feet began to be a little smoother, a little firmer. I began to find joy again. I can proudly say today I am no longer in my deep, dark cave. Of course I still miss my Vance and Roni, I think of what they might look like and what they might be doing at nine and a half months old. But I take comfort in knowing they are secured in Heaven for eternity. One day they will come running to greet me, they will introduce me to Jesus, and show me all the places they had been while waiting for me. I know for now they would want their mommy to be happy and to live life to the fullest… So I will! You maybe feeling like you are at the very impassable end of your dark cave. The path you are on my be shaky and jaggedly painful. But remember the Lord is a refuge for the oppressed, a strong hold in times of trouble (Psalm 9:9-10). The eternal God is your refuge, and underneath are His everlasting arms (Deuteronomy 33:27). Cling to His word and promises because His word is a lamp for your feet and a light to your path (Psalm 119:105). There is nowhere you can go that He hasn’t been and no place you can go where He isn’t right there beside you. 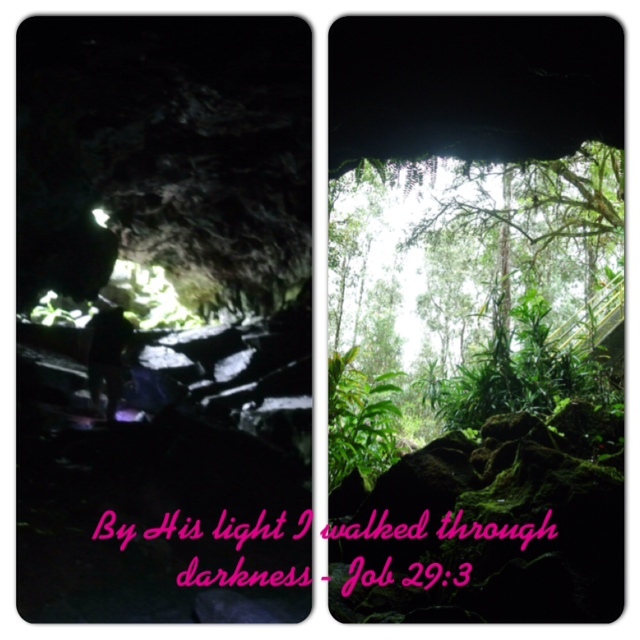 And just as I slowly found my way back to the light at the opening of my cave (both physically and figuratively) I know with God’s help you will too.